Spanish coach Rafael Benitez is Jose Mourinho's replacement at European champions Inter Milan. 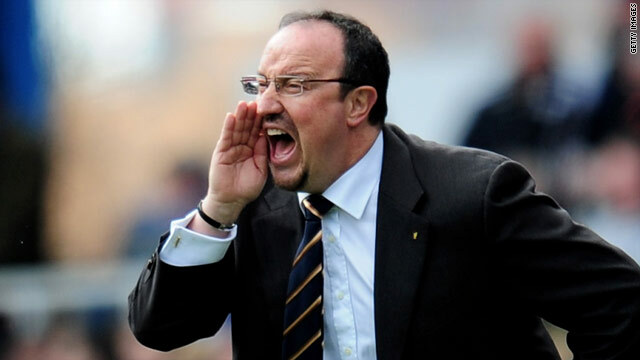 (CNN) -- European champions Inter Milan have confirmed the appointment of Rafael Benitez as their new coach. The Spaniard left English Premier League side Liverpool last month and has been in negotiations with the Italian club for nearly a week. He takes over from Jose Mourinho, who left for Real Madrid just weeks after he led Inter to their first Champions League success for 45 years. A statement on Inter's official Web site read: "Inter welcomes Rafael Benitez. The Spanish coach signed a two-year contract this morning that will run until 30 June 2012. "Benitez will be unveiled to the media in a press conference on Tuesday 15 June." Benitez spent six years at Liverpool, winning the Champions League in his first full season, but the Premier League title eluded him. Before that, Benitez spent three years at Valencia, leading the club to their first La Liga title in 31 years.